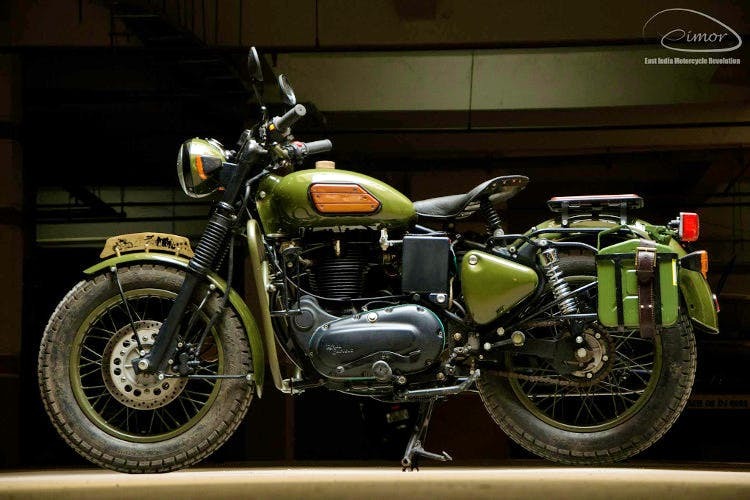 Revered by bikers and artists around the country, the award-winning East India Motorcycle Revolution, or Eimor Customs, in short, can elevate your ride to sheer poetry in motion. The story of Eimor Customs is the story of its founders and artists, Joy and MJ. Stuck in a rut, circa 2010, working dead-end jobs in the IT industry, disillusioned by the fine-arts scene, the pair first bonded over their love for motorcycles — and shared frustration over local mechanics. A couple of years later, with Eimor still in its infancy, awards started pouring in. Most notably for Eimor’s paint job on a Harley Davidson Softail Fat Boy at the India Bike Week, with a galvanising Sagittarius theme. From converting a one-room home into a makeshift paint booth, learning by trial-and-error, to setting up the current workshop, piece by piece, Eimor Custom’s journey is not unlike the roads we’re familiar with in Hyderabad — often bumpy, but one hell of a ride. Fine wine takes time. So if you’re looking to trick out your bike (a paint job, for instance), you’re in for anything between a ten-day to a two-month wait (for a good reason). Eimor Customs never treats two bikes the same. Each project is given exhausting attention to detail, and always with the personality of the bike’s owner in mind. The process is as much about getting to know the rider, as it is about the ride. After the initial conversation and a rigorous brainstorming session over several days, the design is “storyboarded”, so to speak. The actual execution begins once the client has green-lit the design and finish they are looking for. Modification jobs, on the other hand, can take between one to four months, depending on the design. All of this effort culminates in some truly stunning artwork. Take the IKEBANA project for example. Seldom has a Triumph Thunderbird Storm looked this good. Meticulously hand-painted with Samurai Masks, Koi-fish, waves, flowers, birds and other elements of ancient Japanese Art and Tattoo design, the paint job on this cruiser boggles the mind by its sheer finesse.